Think of a marathon….what is the end goal for a runner? The finish line. In order to get to the finish line, a runner must train for months. They start off with smaller distances and record their times, and eventually build each week they train to reach their ultimate goal. 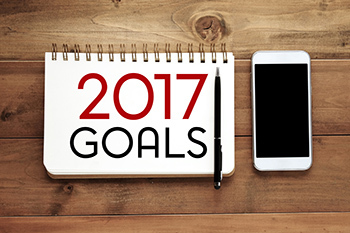 Set specific and descriptive goals. Looking to increase your social media presence? Don’t just set your goal as, “increase social media presence.” Instead, set your goal as, “increase social media presence by doing x, y and z.” By being specific, it lays out a descriptive plan on what you are going to do to achieve your goal. 2. Set a timeline with checkpoints and deadlines. It’s important to not abandon your goals. We understand things get busy and we often abandon our goals, (even the small ones). In your goal setting plan, set checkpoints and deadlines with specific dates. This will keep help you actually see your goals being achieved one step at a time. 3. Stay realistic, but don’t be afraid to dream big. Also, not all goals need to be so large scale--set small goals! Small achievements lead to big achievements! 4. Track, analyze and adjust if needed. Also, don’t be afraid to adjust your goals. Things happen and focuses may need to shift during specific times, so don’t be afraid to adjust if necessary. Just don’t have the mindset that you can always adjust your goals, you can do it! 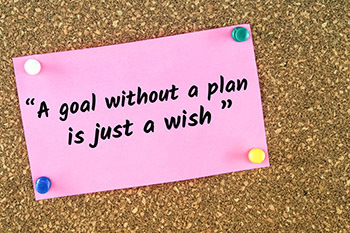 Display your goals in your workplace, create constant reminders for you and your team. The more you are reminded of them, the more likely you are to be more accountable to your goals.